British royal couple Meghan Markle and Prince Harry are expecting their first baby together. The pregnancy news comes five months after the Duke and Duchess of Sussex tied the knot in May at St George's Chapel in Windsor in a ceremony watched by millions around the world. Kensington Palace tweeted the happy news on Monday morning, writing: "Their Royal Highnesses The Duke and Duchess of Sussex are very pleased to announce that The Duchess of Sussex is expecting a baby in the Spring of 2019." The official Twitter account for the Palace added: "Their Royal Highnesses have appreciated all of the support they have received from people around the world since their wedding in May and are delighted to be able to share this happy news with the public." "The Queen, Duke of Edinburgh, Prince of Wales, Duchess of Cornwall, and Duke and Duchess of Cambridge are delighted for the couple and were able to congratulate them on Friday at the wedding in person." A spokesperson for the Palace said that Markle's mother Doria Ragland is "very happy about the lovely news and she looks forward to welcoming her first grandchild". Meghan Markle's mother Doria Ragland is said to be "very happy about the lovely news"
Speculation mounted that Markle might be pregnant after she was photographed at Princess Eugenie's wedding on Friday (October 12) wearing a loose-fitting navy coat that was unbuttoned in the middle. On Monday, the couple arrived into Sydney for the start of a 16-day royal tour to Australia, Fiji, Tonga and New Zealand. It is their first official overseas visit since they visited Ireland in May. 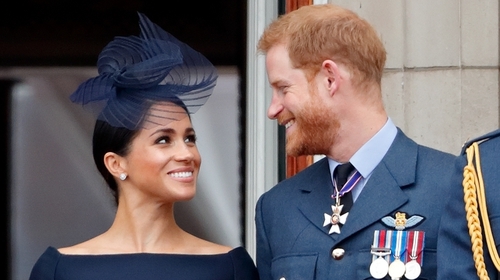 Prince Harry, who is sixth in line to the British throne, began dating Markle in 2016 and proposed to the former Suits actress in November 2017. Markle said it was an "amazing surprise" and "very romantic". The US star opened up about her relationship with the British royal for the first time in an interview with Vanity Fair last year. She told the magazine: "We're two people who are really happy and in love. "We were very quietly dating for about six months before it became news, and I was working during that whole time, and the only thing that changed was people's perception. "Nothing about me changed. I'm still the same person that I am, and I've never defined myself by my relationship." Meghan Markle said of her relationship with Prince Harry "We're two people who are really happy and in love"